After Michael Jacob’s passing in 2014, the FNPI (Gabriel García Márquez New Journalism Foundation) and the Cartagena Hay Festival—which have enjoyed a decade-long partnership—decided to jointly organise the Michael Jacobs Travel Writing Grant as an homage to the British writer. This year, the grant enjoys the support of the Michael Jacobs Foundation. A panel of judges composed by Sabrina Duque, grant holder in 2018, Daniel Samper Pizano and Jon Lee Anderson, professors at FNPI, selected the candidature of Picco amongst 136 applications coming from 24 countries. 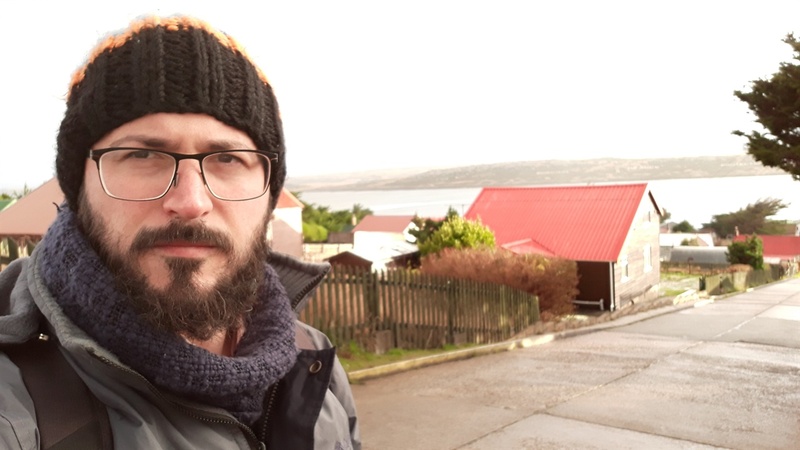 Picco has been awarded the grant thanks to his journalistic project called Un pequeño país aparte, a book on a journey to the Falkland Islands, the object of an ongoing sovereignty dispute between Argentina and the United Kingdom, which caused armed conflict in 1982. For Ernesto Picco, it seems impossible to talk about the Falkland Islands without talking about the war in 1982. However, the armed conflict with Argentina and the disputed sovereignty hides a local story in the islands which is unknown and exciting. Picco’s book aims at that story: How is life on the islands nowadays? Who are the main political and social reference points today? Who are their historical figures? Which are their internal conflicts? How were they before the war? What happened after that? The project tries to answer these questions, combining travel stories and documentary research, based on interviews and tours made on the islands and meticulous work on local files, both Argentinian and British. He is a professor and full-time researcher at Universidad Nacional de Santiago del Estero (UNSE) since the year 2010. He had previously worked for eight years as a radio broadcaster and journalist for El Liberal newspaper, in Santiago del Estero, on very local issues: domestic policy at the Parliament and Government House, some police cases, and some other bit about rural inland areas. He occasionally worked as a special envoy in other countries. He went to Cuba to cover the news on the régime and the journalist trade in the island, to the Dominican Republic to write about an environmental summit, and to Uruguay on the trail of an international corruption case involving several governors, his city’s local governor being one of them. Also, he wrote about the Falkland Islands a couple of times from afar. He has a Ph.D. in Social Sciences from the University of Buenos Aires, after publishing a thesis on the relationship among the media, the State and the Catholic Church. He currently works as a freelance reporter and has published a number of articles in national magazines such as Revista Crisis, Revista Anfibia, Tucumán Zeta, and Subida de Línea. In 2014 he won the Crónicas Interiores Award, organized by the Regional Union Luz y Fuerza and Revista Anfibia, for a story about two murders committed by the provincial police. In 2015 he was shortlisted for the Nuevas Plumas Award, organized by the University of Guadalajara and Escuela de Periodismo Portátil, for his story about the death of forty prisoners in a riot at a male prison in Santiago del Estero. The same year, he was nominated coordinator at UNSE Radio, where he works on issues related to scientific dissemination and local and national news. The university publishing house will soon publish his work Aquí pasa todo esto, a compilation of thirteen articles about Santiago del Estero. He has been looking for stories that keep him traveling and visiting other places ever since. This grant’s purpose is to provide an incentive for travel journalism. The fourth edition awarded 7,500 American dollars to a travel book or article project that takes Spanish Latin America or Spain for its subject, to be published in Spanish or English. In selecting the winner, the jury considered the narrative quality and the journalistic depth of the projects. For Michael Jacobs, travel journalism went beyond the mere anecdote, and this grant therefore seeks work capable of awakening the five senses and opening the mind of the reader. From its first edition, this scholarship has made visible new journalistic references in the field of travel writing: Álex Ayala Ugarte, from Spain, winner in 2015 with his book Rigor Mortis: La normalidad es la muerte; Federico Bianchini, from Argentina, winner in 2016 with the book Antártida: 25 días encerrado en el hielo; Diego Cobo, from Spain, winner in 2017, with the series Huellas negras: el rastro de la esclavitud. In 2018, the winner has been Sabrina Duque, from Ecuador, with the project Nicaragua: pueblos, lava y ceniza. For more information about the scholarship details, click here. Michael Jacobs was born in Italy in 1952, spent his youth in England, and later travelled to different parts of the world, investigating and writing about Spain and Latin America. He became a notable Hispanist and a passionate devotee of Spanish culture.